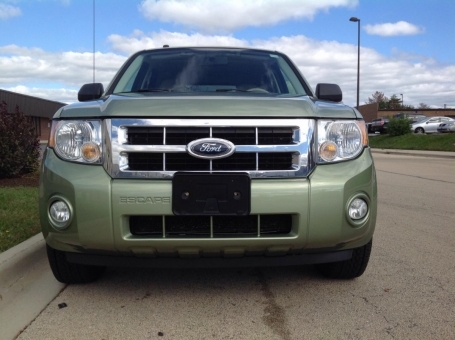 This 2008 Ford Escape XLT is a small crossover SUV with a fuel efficient 4 cylinder engine, spacious interior, and ample cargo space. This edition is newly detailed, clean, sharp,and drives very well. This vehicle looks terrific on the exterior. The interior does have stained carpets and seats. Pictures have been provided for your review. The Escape is a great means of transportation for small, active families.it has car-like handling, is easy to maneuver, and fun-to-drive. This vehicle has a great exterior color that is sure to turn heads, " alien green." Options include a sunroof, power seats, windows, mirrors, locks, alloy wheels, newer Yokohama tires, roof rack, combination lock entry, AM-FM stereo with satellite radio and CD player.